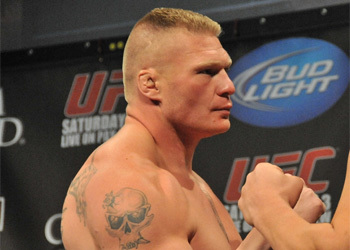 After a dramatic come-from-behind victory over interim title holder Shane Carwin at UFC 116, undisputed heavyweight champion Brock Lesnar reiterated what most inside the MGM Grand Garden Arena were forced to admit, that Brock Lesnar is THE BADDEST MAN ALIVE. The highly anticipated showdown was dubbed “the biggest heavyweight battle in history” and the behemoths didn’t disappoint. Despite threatening a southpaw attack to bolster his shots, Lesnar opted to stand toe-to-toe with Carwin and ultimately ate an uppercut in the opening ticks for his troubles. Lesnar miraculously survived an early barrage of bombs and extended Carwin further than any other adversary had ever done – past the 1stRound. Unfortunately for the engineer, the second stanza was nothing like the opening five minutes. Despite entering the 2ndRound with a bloodied and battered face, the former Division I All-American collegiate wrestler put Carwin on his back and landed in half-guard. In another dramatic turn of events, Lesnar opted to pass on securing a dominant full-mount position. Instead, the crafty-one took side-mount in order to end their heavyweight unification bout with an arm triangle choke at 2:19 in the 2ndRound. “I am blessed by God. I stand before you a humble champion and I’m still the toughest S.O.B. around, baby,” Lesnar sheepishly said. It was Lesnar’s first professional fight in 12 months due to a life-threatening bout with diverticulitis. On Saturday night, he rose from the ashes like a Phoenix and silenced his detractors. Cain Velasquez gets first dibs at the undisputed king … best of luck.